Welcome to Winches Direct, a wealth of information for all kinds of lifts, winches, cranes, hoists and other tools you might use for picking stuff up. Regardless of if you need to lift a car, beam or an engine, we are here to make sure you find what you need. Winches Direct provides a wide range of information on how different types of winches, lifts, hoists and cranes work, so you can quickly learn the mechanics of how these extremely helpful tools work. We also provide detailed comparisons and reviews of each of these tools with video guides and tutorials of how to use them, so you have the knowledge to get the right tool, should you need to buy one. Winches is a lifting or pulling devices with a cable, strap, rope or chain which is wound around a rotating drum. Typically the drum is driven by an electric motor or hand crank to lift or pull an object either vertically or horizontally. Winches are available for a huge amount of applications, ranging from trailer winches and portable cable pullers to electric winches. An extremely popular use of a winch is a trailer winch, which are commonly fitted to the tongue end of a trailer with a steel or synthetic cable and hook. Boat trailers are the most common type of trailer winch and they make pulling a boat out of water a pleasure, rather than a chore. We recently reviewed the top 12-volt electric boat trailer winches here. Fishermen and pleasure cruisers also use winches to lower and raise their anchors. Although these winches have less pulling capacity compared to a boat trailer winch, they can make life an awful lot easier, especially on a small vessel where movement is limited or simply inconvenient. You can read our reviews of the top 12-volt electric boat anchor winches here. Come along winches which are also know as cable puller winches or hand winches are another popular type of winch. This winch has a fixed hook mounted at one end, a lever attached to a manual ratcheting crank and a hook attached to a steel cable extending out of the other end. If you need to pull or push a heavy object by hand, then the cable puller winch is a great choice. Anyone who drives a pickup truck or 4×4 off-road regularly have come to rely on electric winches, almost as a way of life. Fitted to the bumper of Jeeps, pickup’s and 4 x 4 vehicles the electric winch is used to extricate a vehicle from mud, a ravine or any other location you have got stuck. Powered by the battery of the vehicle you are driving, all you have to do is spool out the cable, attach the winch around a tree, boulder or other such object and pressing a button to winch your vehicle back onto the road, ready to carry on. 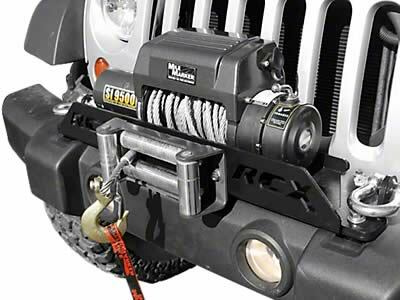 Read our review of the best electric winches for the money. Vehicle winches are not only used for leisure of sport activities, they also have commercial uses, being used on tow trucks to pull a car onto the truck bed for towing or for moving heavy farm equipment. Lifts come in 3 different types, firstly you have material handling lifts, then personnel lifts and lastly auto lifts. 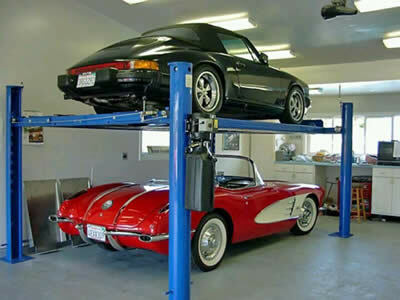 Auto lifts, which are also called car lifts are used by home and professional mechanics to simply raise and lower pickups, cars, trucks, motorcycles and all other types of vehicle, including lawn mowers so they can perform maintenance or repair tasks. Car lifts come in all shapes and sizes and you have a choice of four post lifts, 2 post lifts, single post, scissor lifts or portable car lifts and lastly car ramps. Personnel lifts on the other hand, raise people up between levels of a building so they can perform routine construction or maintenance jobs. This would also include building elevators or wheelchair lifts which help folk move from one level of a building to another, when they are unable to use the stairs. There are also electric chair lifts which are used by the infirm and elderly and sling lifts which are extremely helpful at aiding patients in and out of baths, beds and chairs. From a construction point of view, you have lifts on wheel which are portable and used for lifting heavy objects or manoeuvring larger objects like girders, ready for fixing into place. These material handling lifts are mainly used in construction, manufacturing, storage and office environments and include boom lifts, drywall lifts, scissor lifts and material platform lifts which can be manoeuvrable or fixed. Lastly you also have trailer tailgate assist lifts that as the name suggest, assists you in lowering and raising your trailer tailgate. If you are looking to lift a heavy object or load, you need a chain hoist. These clever and simple tools are used mostly in industrial locations like machine shops and garages. With minimal force, you are able to hoist heavy loads, simply by pulling on a chain, lifting considerably more weight then your normal strength would allow. Manual chain hoists are by far the most common hoist deployed in industry, you also have pneumatic, sometimes called air, and electric types as well. The air chain hoist and electric hoist require much less effort to lift a heavy object vs their manual counterpart. By simply pushing a button on the controller, you can raise and lower objects weighing many tons/kilograms. 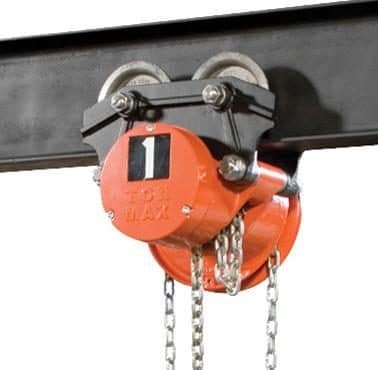 Although the manual chain hoist might mean a little more effort on your part when compared to pressing a button on a controller of an electrical or air hoist, the design and advantage delivered by a mechanical lever chain hoist makes lifting a heavy object an easy task. Hoists are not only used in the work environment but they are also extremely helpful in lots of situations at home. Mechanics at home may use an engine hoist to lift an engine out of a car, truck or SUV, or perhaps you may need a Jeep hardtop hoist or canoe hoist system to store your canoe and hardtop. Other uses of hoists at home might be garage door openers which are extremely popular or if you are a hunter, a trailer hitch deer hoist will help you to lift and clean heavy game with little effort. Lifting equipment can be used in virtually any industry or environment, but there are some circumstances where cranes are such an important part of the task that it couldn’t be done without them. Whether it is building the tallest skyscraper, moving material around a warehouse or placing a swimming pool in a backyard, cranes have shown they are an integral part of our world. Even the smallest jib crane utilising an electric chain hoist in a warehouse is there because someone recognised that its use made completing the job easier, safer and cost-effective. Specific jobs need specialised equipment and cranes are one of the most highly adapted tools used across a vast array of industries in all conditions and environments. Here are five of the most common types of cranes in use the world over, showing that this type of machinery is something we just can’t do without. These types of cranes are common in industries where the constant movement of heavy materials are required throughout production processes, such as the steel industry. Also known as a bridge crane, overhead cranes utilise a hook-and-line mechanism that runs on a horizontal beam, which in turn traverses two rails, which are usually spread well apart. Overhead cranes can be configured using either single or double beams. Single beam cranes are known as a single bridge box girder crane, while double beam units are required for heavier lifting capacities, usually 10 tonnes and above. These are one of the more widely used cranes and can be found in all shapes and sizes and working in a wide variety of industries. They will typically be found in warehouses, industrial premises and even on military vehicles. A jib crane utilising an electric chain hoist has a horizontal member and is fixed to either the ground, wall or other secure footing, such as a truck bed. It is capable of swinging through an arc and can also be fixed. Hoists are another type of jib crane that can be used for lifting heavy items in such situations as from the bottom floor to the second level in a warehouse. These types of cranes are most often seen perched on the top of tall buildings during their construction phase. Sitting in the cab of one of these monsters is certainly not a job for the faint-hearted! A type of balance crane, they can be fixed to the ground or onto structures to provide the ultimate in lifting and height capacity. 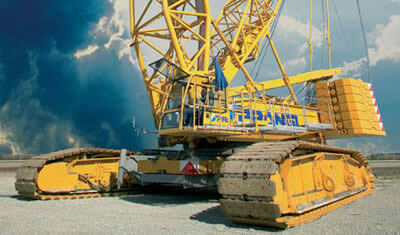 A mast gives the crane its height and is attached to a slewing unit that lets the crane rotate. A long jib (or working arm), a shorter counter jib and operator’s cab sit on top of the slewing unit. The counter jib carries a counter weight while the longer horizontal jib carries the load from the centre of the arm. While tower cranes can sometimes be operated remotely, most often they are controlled by an operator in the cab a with the help of a dogger or rigger, who acts as a signaller on the ground. For the ultimate in gantry cranes, you can’t go past those used to unload shipping containers at a busy port. They are the best example of a type of crane that has been adapted for uses in a wide variety of industries and environments. A gantry crane uses a hoist to lift very heavy objects and is mounted on a machinery house or trolley that runs along rails. They are usually made to very precise specifications for individual industries due to their highly specialised nature, such as the container crane. The can come in all sizes but are most effective in shipyards and big industrial settings where their design means they can consistently and efficiently lift extremely heavy loads. Usually seen on the back of trucks, they are invaluable when it comes to the loading and unloading of materials. Although they can be quite versatile in terms of their reach and lifting ability, they can also be compact when folded back and not in use. Loader cranes use a hydraulically-powered and articulated arm, which can also be telescopic for greater reach. Most often loader cranes are directed by the operator using a portable cable control system or crane-mounted hydraulic control levers. Jacks are used to raise heavy objects like a car and are portable and easily moved around. 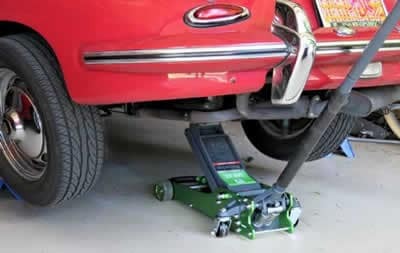 The majority of people have used or at least seen a car jack; usually stored with your spare wheel in the trunk of a car, they are used to jack a car up to change a flat tire. Jacks are not just used for cars, however, they are also common lifting tools used in construction, farming and even for lifting motor homes. Floor jacks are very handy and useful tools. Hydraulic jacks are typically manufactured from horizontally placed pump jack assembly that stretches out between two metal support pieces. Four metal wheels can be found just below the metal support that allows the jack to be lugged around on a smooth and solid surface. It should be noted that concrete is the recommended surface for floor jacks. As with any other tools and equipment, the capability of your automotive jacks should be sufficient for the job that you need to complete, so make sure you have the right one, before you lift any vehicle. Automotive jacks have different ratings starting from two tons to twenty tons. You should note though that the capacity of any floor jack or jack stand should not exceed at least half of the vehicle’s gross weight. For instance, if your car or vehicle weighs 3 tons, then you need an automotive jack that has a 2-ton capacity to lift your vehicle. For your own safety, avoid using the floor jack as the sole support of the vehicle. The load should be distributed and this can be done with jack stands to support the weight of the vehicle that you want to lift.